They are simple to make, but you can get really creative on the gift delivery method. I have made my own wrappers and put them in a box, to create a super classy treat for friends. 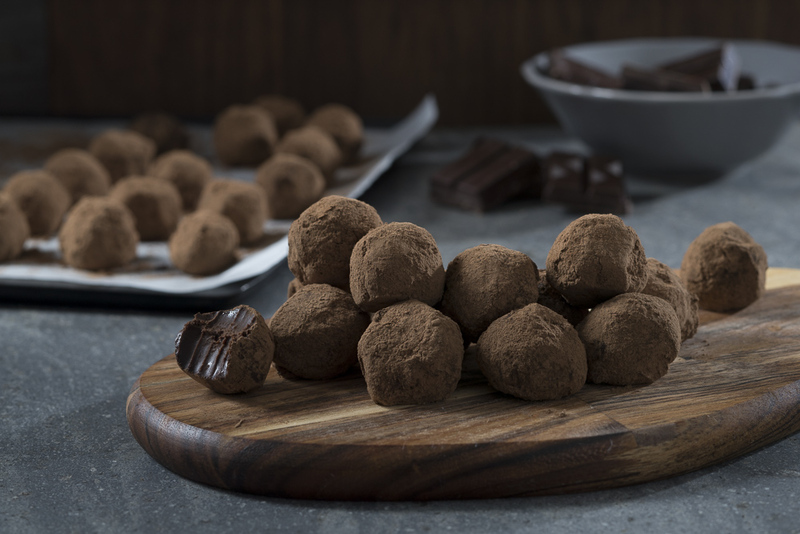 These truffles can be made in advance and will last up to a week or so in the fridge. Place the dark chocolate pieces into a bowl with the coconut oil. In a small sauce pan over high heat bring the cream to a simmer. Once simmering reduce heat to medium and allow to infuse 5 minutes, then pour over the chocolate and coconut oil. Stir until combined, add the salt and mix until smooth. Place a piece of baking paper on the top of the chocolate to prevent a film from forming. Allow to come to room temperature. Once cooled to room temperature place the bowl in the refrigerator for two hours. Once set, remove the bowl and allow the chocolate to come back to room temperature for a few minutes. This will make it easier to scoop. Using a teaspoon scoop out little balls of chocolate and using your hands to shape them into a ball. Dust with cacao powder, and arrange on a tray or container with extra cacao powder.